My wife Ina, some of you know her, did accompany me on a business trip to Longyearbyen, Spitsbergen and wrote down her impressions on the destination. It was a bumpy approach and a shatternig landing which made me hold to the armrests of my seat wondering if someone will call out an emergeny. The time was shortly after midnight, bright sunshine, and I was sittng next to a stranger , because as usual my husband was in front, in the cockpit and missing at times of danger and need. It felt like we had run over a polar bear or hit an iceberg. Bare cold mountains could be seen almost pressing against the plane’s windows. The cabin crew casually warped up in scarves and put their gloves on before opening the doors. So everything was normal, after all. 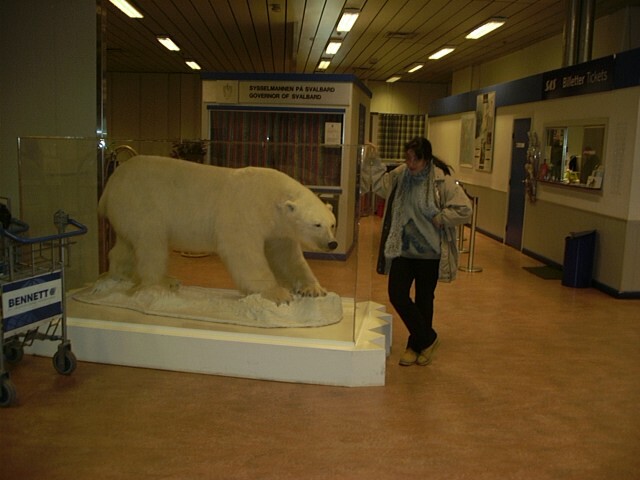 There was an icebear to greet us in the terminal which was stuffed with the importance of its message, personally from the governor of Svalbard:take the ice bear danger seriously. From the passengers of the landed Braathens plane I distingusished two completely different groups of people: the locals who rutinely took their baggage and quickly drove away without wasting time and the tourists, who clogged the passage in the small terminal for a while, then were slowly pushed out of it, blinking perplexed and disbelieving at the Norwegian midnight sun. The latter group, to which my husband (now found again) and me belonged, got all together on the bus, which was the shuttle to all three of the island’s hotels. The road "downtown" was even and the asphalt looked new, not a scar of any division line or the usual restictions and warning of road signs. It went along the coastline and the harbour, past old and deserted coal mines where spilt coal glistened like treasure abandoned during an accident. Soon the first huddled houses in shockingly bright colours were visible. The bus pulled up to a halt in front of a long grey and red building, the Radisson hotel. The Norwegians among the tourists quickly took off their shoes before they entered the reception. A notice reminded those carrying arms that the chance of meeting an ice bear in the pub and the restaurant of the hotel was not very big, so guns and pistols were accordingly stored and locked in a special gun-locker. For the first time in my life I felt to be missing an essential piece of equipment. .. It was not easy to find sleep with a never-setting sun. Moreover that the weather seemed to be playing us little tricks: for the following week it stayed mostly cloudy during the day but sent us in bright sunshine to bed . The next morning we put on our warmest clothes and impatiently rushed to discover the secrets of this northernmost town. Two neat rows of wooden public buildings, all of them with the typical cosy Scandinavian look I knew from our Ikea Shops, channeled the wind along the main street. Depending on the wind’s direction people rushed forward or stooped and fought for every step, but sooner or later always landed in front of the life-size statue of Longyear, an American miner, who also gave his name to the town. A few hours later we had already tried all of the town’s cafes and pubs and found out that cafe Busen (which was as we expected full of German and other adventurers) was the place to be during the day. In bad weather the whole of the camping community was there profiting from the generous refills of coffee an tea cups. For the evening, which had become a relative notion by our second sunny night there, KROA was the ultimate place to be. KROA means simply a café or a pub, though one with a difference, because it calls itself the café "at the end of the world" (the latter written in Russian). It had the rugged interior of a coal mine with its walls paneled with coarse wooden planks, though not without a touch of luxery which manifested itself in the lavish use of bear and deer skins upon the benches and the marble bust of Lenin as a centre-piece and inspirerer of the well-stocked with spirits bar. 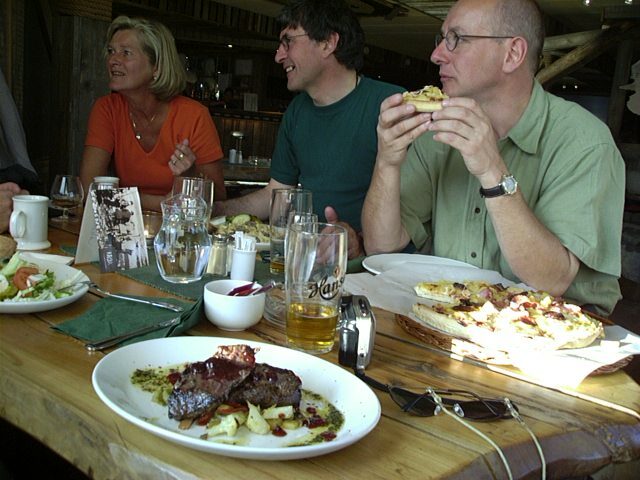 The food there was an experience worthy of the geographic exclusivity of the pub. Serious drinking, as well as sauna, are some of the basic survival techniques of arctic life. On the sunny evenings during the short arctic summer the pubs have a familiar atmosphere, everybody knows everybody in this one-thousand-soul community and even the tourists, few at this time of year, start to know each other and are promptly socialised only after a beer or two. It was the same traditionally Norwegian warm and inviting atmosphere I experienced in the sauna too, although, as it came out later, not a single soul there was Norwegian and I am not usually used to that kind of welcome. After my husband had dutifully inquiried about its dress, or shall I say undress code, according to which no swimmimg costume was required, he gallantly opened the door of the hot wooden cabin to let me in first. I am not shy, but it still took a moment for me to regain my composure before the gaze of 5 men inside. They revealed themselves in turn as congealed British and German campers warming up and enjoying the luxery of the hotel shower. In the crystal clear air of the Arctic, distances seem deceitfully close. We found that out for ourselves on the next day when we were lured into an endless march towars the Huset, a pub on the other end of town, which seemed just a stone throw away from our hotel but answered more appropriately than KROA to the description "at the end of the world". The absolute solitude of the walk was livened up by the shrill echoing calls of the arctic terns high on the rocky plateau above. Numerous flocks of birds have found shelter in the wooden constructions of the enterances to the abandoned coal mines. From the road below their white bodies and wings matched shockingly a group of snow-white crosses perched in a graveyard on the opposite hillside. That is the stuff horror stories are made of, I thought, and this is a natural location to shoot ghost films at! I tried to joke that if American film-makers knew about that place, Svalbard might soon turn into a destination for mass tourism. Later in the Huset my smile froze as I learnt from the fiends we had made in the sauna, who were more experienced travellers in these lattitutes than ourselves, about the monstrous secret of that forsaken graveyard; how the permafrost gradually moved the layers of earth and brought the buried bodies to the surface… How nobody comes to life or eternal peace in this corner of the world. They told us that delivering women are flown to Tromso to give birth, as well as the rejected bodies to be buried properly. For me that was a lesson and a sober tale about nature which can be defied, but not subdued. People are the intruders into this kingdom of ice-bears, seals and whales and nature revengefully hunts on them as they hunt on its creatures, thretens their lives, rejects the offering of the bodies, and preys on their covetous wish to challenge its icy frontiers… We swallowed the delicious local dish guiltily, cancelled the eerie walk past the bodiless graveyard and took a taxi to our hotel. 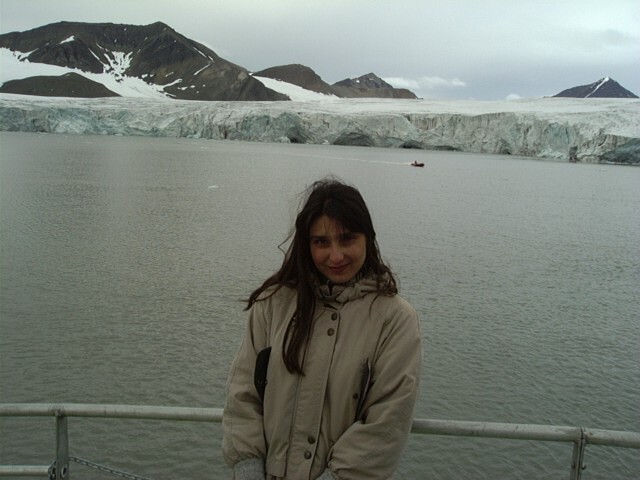 In August 2000 I had the chance of visiting the Spitsbergen Achipelago while on a research. During this trip, I also did a visit of Longyearbien's international airport, ENSB. I want to share my results with you here. The Spitsbergen archipelago is located some 400 NM North of the Northkap, its settlements Longyearbien and Ny Alesund representing the northermost communities in the world. All in all, some 10'000 people live in Spitsbergen, divided in Norwegian and Russian communities. Primary economic product is coal mining, but in recent years tourism has sprung up quite a bit around the political and economical center of Svalbard, Longyerabien. Links to the outside world are guaranteed by sophisticated electronic connections over satellite to the Norwegian Mainland and by ship and aircraft for transport of goods and people. The isolation of the islands is one reason, why a fully working airport with instrument facilities is a vital part of life in Svalbard. It’s airport, ENSB, (LYR) at Longyearbien has therefore the demanding task of guaranteeing the inhabitants and visitors to the archipelago travel possibilities and is a main source of transportation and supply line for the working community here. It is because of the working link, that Longyearbien has got facilities that most other isolated destinations in the polar region can only dream of: 5 hotels of different standards, lead by the Radisson SAS Polar Star, a 5 * establishment. The main street of Longyearbien features all facilities of daily life such as a well equipped hospital, several shopping facilities amongst which the Svalbard Boutikken, a large food and convenience store of the size of a major Migros Market and many other facilities including cinema and sports center with swimming pool. All these institutions depend heavily on a working airport that can be used all year long. 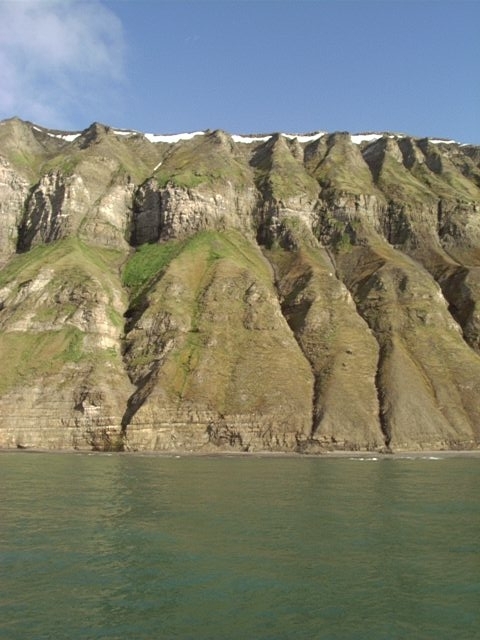 Spitsbergen is located in the polar region well north of the polar circle. In general it can be said of Spitsbergen, that it is an arctic desert, with very few precipitation. Temperature averages 6 degrees C in summer and –14 degrees in Winter. This relatively mild climate for such a high lattitude is attributed to the Gulf stream which keeps most of Norway’s coasts ice free before it proceeds further north to end at Spitsbergen. Temperatures can get as high as 21 degrees in summer and as low as –40 degrees in winter, however, in the huge majority of times, the weather conditions are suitable for normal operations. In summer, fog can present a problem for a short time, whereas in winter, conditions are cold but clear. Winds prevail from the south east. 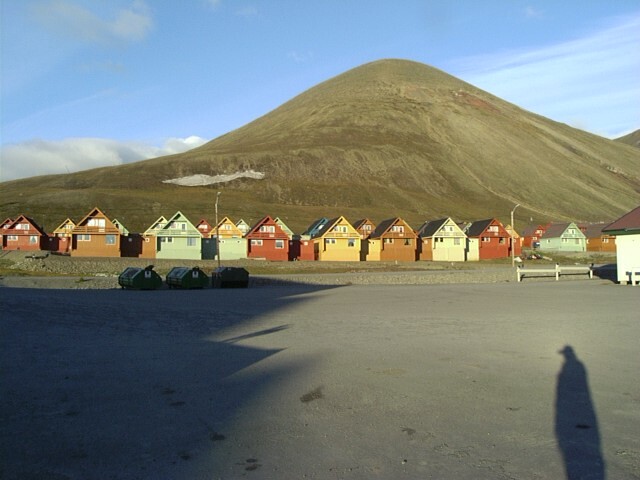 Longyearbien is located in the area affected by midnight sun and polar night. Between April 19 and August 23, the sun never settles. In fact, mostly at night, the area is bathed in sunlight. Between October 28 and February 14 however, the sun never rises, leaving Longyearbien in the dark. It is noted on the Jeppesen Approach Chart, that with winds between 160 and 270 degrees and speeds of more than 20 kts, windshears may occur on final approach runway 28. 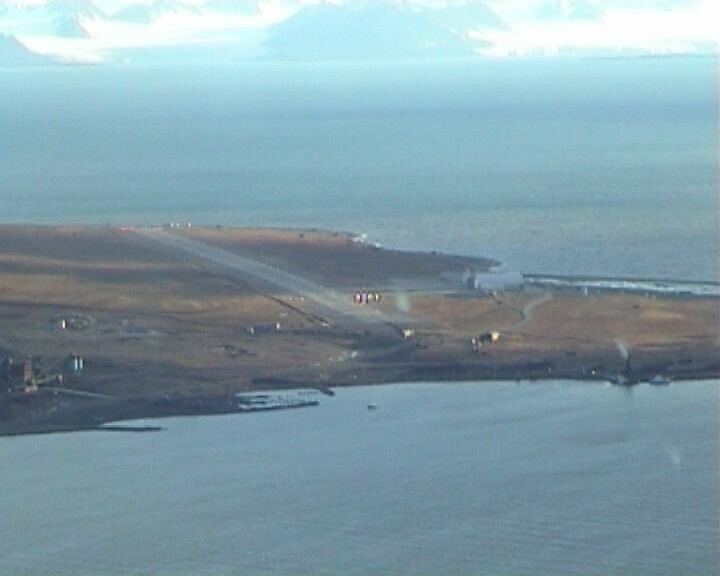 The airport of Longyearbien is located about 3 km west of the township, on a flat piece of land on the shore of Adventfjorden. It features a single runway, direction 10/28 with Instrument approach facilities for both directions. ATC is provided by a fully IFR licenced AFIS service, that, at the same time, watches over the rescue center that serves the island. ENSB is useable all year round, and in the time since it’s opening in 1975, only very few flights had to be cancelled due to weather conditions. Noteworthy is the fact that variation is a mere 3 degrees East, in spite of the close proximity to the pole. As a general impression, the staff at the airport are highly trained professionals, that work hand in hand even tough a competition exists between the 2 handling agents. There are no language problems whatsoever, neither in ATC, nor Airport Authority, handling agents or services. 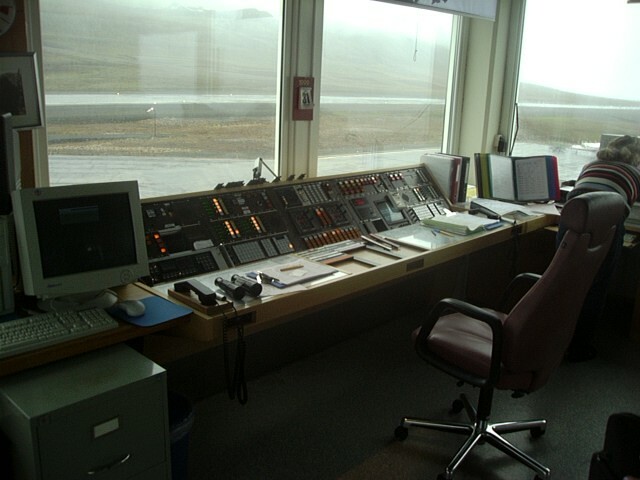 Longyearbien ATC is handled by a fully IFR licenced AFIS service, which provides 24 hour flight watch on 2 VHF and 2 HF frequencies. Met reporting and snowtam services correspond fully to ICAO standards set for civil aviation, and to the rules and regulations set out in the Norwegian Air Law. Both are available 24 hours. The tower cabinet features very modern equipment, including fully digital VHF and HF transceivers, VDF, wind monitoring, telex, fax, internet and all that is required for a organized flight operation. VHF frequency 118.1 is used for airport communication and is propagated via 3 transmitters, one on the airport, one at Kap Linne, (ISD NDB) and one more at Barentsburg. VHF Frequency 119.45 is the initial frequency for contact. It’s transmitter is located on a 3000 ft mountain east of the airport, which allows propagation for several 100 NM. On my flight in, the first contact was established on reaching FL 310 out of Tromsoe. HF frequencies 4666 (primary) and 5680 (secondary) are available for HF long range communications, such as to announce a diversion from outside VHF coverage. An ACARS ground station is planned by SAS and in use by Braatens on trials. AFIS can be reached by telex on ENSBZTZX. Longyearbien Airport is open 24 hours daily, with it’s ATC manned around the clock and around the year. The airport director is Tore Holand. Customs and Immigration are available at a prenotice of 15 minutes around the clock. Fire services CAT 6 have a round the clock pikket service with CAT 4 and CAT 6 available at very short notice. Due to the close proximity of the city, response time is never more than 30 minutes. Fire services are automatically called up from stand by whenever an aircraft is known to be headed for ENSB. The runway has a total lenght of 2323 meters and a width of 45 meters. Runway 10 is classified a 4C Precision Runway, whereas Runway 28 is classified a 4C Non Precision Runway. The runway is lighted with standard ICAO type HIALS and HIRL with 60 m spacing, PAPI in both directions. At the end, runway 28 features a turning pad of 55 times 60 meters. Runway 10 also features a turning pad which is temporarily not available due to the construction of Running Rabit approach lights for that runway, a feature already introduced to runway 10. The runway surface is made of grooved asphalt. As the runway is built on ground with permafrost, earthworks will make for changing conditions, however, while a bit on the bumpy side, the runway is well maintained. Runway slopes range from 0.4 to 0.8 to an average of .6. It is noteworthy, that there is no overrun available on both ends, as terrain falls quite steeply down to sealevel. The temparary construction limits the LDA/TODA to 2140 meters, the works will be finished shortly. There are 2 taxiways connecting the runway to the apron area, both with a width of 23 meters. Their bearing strenght is D, there is standard lighting and no obstacles. The AIP information is correct. The apron consists of a rectangular paved surface with bearing strenght C to D. A Helicopter pad is attached which has strenght B. There is some lighting outside the apron. Marshalling is available by the airport authority. Jet fuel and AVGAS are available in abundance, with a tank farm of 2 million liters available at Longyearbien. There are 2 fuel trucks of 20'000 liters capacity each to refuel the aircraft. Given the cold temperatures, that means that about 36 tons of fuel are available to fuel from the trucks, before they have to go for more. Longyearbien features a full hospital with doctors and nurses, who, in case of medical emergencies, can render support to passengers and crew. The airport can be reached by the ambulance with a response time of 4 minutes. However, only one ambulance car is available. According to the airport manager as well as the station manager, the largest plane ever to land at ENSB was a DC10-30 of SAS some years ago, which was handled without any problems. More recently, Condor operated several flights with a 767 (Y280) into LYR also without any problems. The airport manager and also the station personel state, that they see no real problem handling a diverted MD11 or A330, as far as fuelling, passenger handling or the likes are concerned. The only problem might be the lack of a highloader, which means that unloading ULD’s is a problem. This is usually solved by unloading the door side ULD using a modified forklift, then moving the remaining ULD’s to unload and load them in the hold, then replacing the doorside ULD. This method has been successfully applied for both the DC10 and the 767. There are 3 steps that are sufficient to reach the door of an MD11. The AFIS composes and transmits snowtams and runway conditions together with the metar and TAF information. The airport uses a BV11 vehicle to measure BA/FC. Braking action is improved in winter by the use of sand which freezes into the surface. There is one de-icing truck available now, with a 2nd one on order to be delivered in September. Type used is Kilfrost Type 1 and 2. De-icing training is conducted by the airlines. The last AIP revision dates from Feb 24, 2000 and is coherent with the Jeppesen Data dating from the same date. There is no obstruction chart available at this time. For crews not operating on a regular basis into LYR, preference is given to runway 10 for landing and 28 for depature, to provide a obstacle free approach and take off. However, Instrument approaches for both runways exist and are used daily. The navigational aids have not had a failure or out time in the last 2 years. No radar or WXR is available. There are no restricted areas or prohibited areas in the vicinity. Both landing directions feature HIRL, HIALS and running rabbit lights. There is a flashing white light located at the beginning of each ALS. The terrain situation around the airport requires pilot attention. The approach 10 and departure 28 are free of obstacles, however, south, north and east of the airport, high terrain exists in close proximity. The ILS approach 10 is a standard ILS approach which requires no special comments. From the IAF of ISO NDB or LON NDB, an intermediate approach is done to a DME fix,from where the localizer is intercepted. The FAF is represented by a DME fix, at which descent is started. The MDA (QNH) of 463 ft (Cat C) and 732 ft (Cat D) is rather high but manageable with ceilings normally not below 1000 ft AGL. The go around procedure of RWY 10 requires a coordinated right turn with speed limitations to clear that terrain. Acceleration should not be begun until reverse course is reached. The localizer approach to runway 28 has no major difficulties apart from the fact that the localizer is offset 16 degrees S of the runway centerline. The approach starts either at ADV NDB, from where a teardrop pattern at 5000 ft leads to the localizer, or at SV NDB with a direct lineup. The glidepath of 3.8 degrees requires a descent rate of 960 fpm at 150 kts. The minimum in any case is at 530 ft QNH for all cathegories. A correction to the right followed by a visual final turn is required to land, there is ample space over the fjord to execute it. The missed appraoch here is very much straight ahead to 10 DME and a turn back to the holding pattern. As Svalbard has no control tower, but an AFIS, aircraft receive advise about traffic’s position rather than direct orders. With the very low traffic volume, that is no problem whatsoever. AFIS has no radar available so procedural information is used. In reality, very few differences to a normal controlled IFR approach exist. The first time I noticed a difference to a normal approach communications was, when instead of a landing clearance, the frequency 118.1 gave a simple information of „Runway is clear". Communication is strictly english. The traffic situation is very quiet. Normally, there are 3 scheduled flights per day, one at noon and 2 at night. Outside these hours, practically no traffic exists. As Svalbard is a military exclusion zone, no military airplanes are allowed into that airspace. Scandinavian Airlines operates a full station at LYR. Station Manager Egil Lindberg is available 24 hours a day on his mobile phone +47 / 95 71 51 41. From alert to readiness on the airport, a maximum of 15 minutes is needed. Handling charges are according to agreements between SR and SAS. All aircraft types are accepted for handling. There are full cargo handling facilities, as well as a GPO connection. The airport features a departure hall with 6 check in counters and an arrival hall with one racetrack. A coffeeshop sitting around 100 people is available in the terminal building. The airport features a VIP room at the airport authority offices. There are some restrooms available. There is no airport hotel as such, but the North Polar Institute owns a containerhome of about 40 beds at the airport. However, in town, 5 hotels can bed down up to 500 people. Radisson SAS Hotel, 99 rooms, 260 beds. All these hotels are suitable for passenger accomodation with generally high standard. Food on the island is excellent. There are 5 restaurants, with ample accomodation. I took time to sample all but one of them, and from a gourmet meal in the SAS hotel to down to earth but excellently prepared meals at the Basecamp, all the existing hotels and restaurants are of a very high standard. Ground transportation is provided by the Svalbard bus company, who own about 8 busses with 50 seats each. Passenger transportation is quickly and easily organized. Taxi minibusses can cater for the crew. Driving time is less than 10 minutes. Transfer to scheduled destination is not possible by ground transport. Either air or sea transport must be organized. There is a catering company that is a part of a local restaurant, the Kafe Büsen. Catering can be ordered via SAS. The company has all necessary facilities to cater for any aircraft. The highloader is a modified forklift but does the job The standard of food, judging on a meal in the Kafe, is very good and to the standard of the island, which is generally of an above average restaurant character. Equipment is numerous, but in excellent condition. Due to time constraints it was not possible, nor did I think it necessary, to actually jot down all the makes. SAS and Braatens are using both equipment together. There are 3 passenger stairs, all with more than 5 m platform hight. 2 GPU’s, 1 Airstarter, 5 each pallet and container dollies, 3 conveyor belts, 1 Galley highlifter and 1 ACU. At the moment there is no highloader, but a forklift available. There are no towbars available other than for B737 and MD83. They are not really needed for normal operations, as there are no nose in parking stands. In an emergency, a disabled aircraft would have to be moved using heavy equipment provided by the governor’s office.